I must ry these.Anything with chocolate chips in is a favourite around here. These look great! I am loving it over here so I am following along. Sounds easy to make! I'll give this one a try! Am going to make this today, and will time myself, too! Oh Char you have me laughing..but hey we all 'goof up' sometimes and we make the best of it! Chocolate chip anything is my favorite! I am on a diet this week and I found myself almost lickig my computer screen over this post! You can bet I will be making these as soon as I can. this looks PHENOMENAL! chocolate chips need to be in everything... anyway, thanks for sharing, looks great! Charlotte thanks for the great recipe I tried them this morning and they are delish. You may be faster than you think,I had to hurry like mad to get all your steps done in 6 min. 30 sec.They were well worth it. oohh, cant wait to try this! I made this recipe tonight. Very tasty. Next time I would cut down the sugar, and/or use dark chocolate rather then milk chocolate chips. My oven also took at least 30 min to cook these through if not more, but my pan was smaller then suggested. These look wonderful and easy. I love the easy part!! I went home and made these last night for my hubby - very yummy. Thanks for this simple & quick recipe. I made this yesterday, pulling it out of the oven right before the kids came home from school. The kids eagerly tried it and declared it "SO GOOD!" I will be making it again tomorrow when I have 15 teenage girls over for their youth group night. PS- I made it in 8 minutes..I had to measure my cookie sheet. Can I sub butter for the oil, and if so do you have a rough idea of how much to use? these were wonderful. 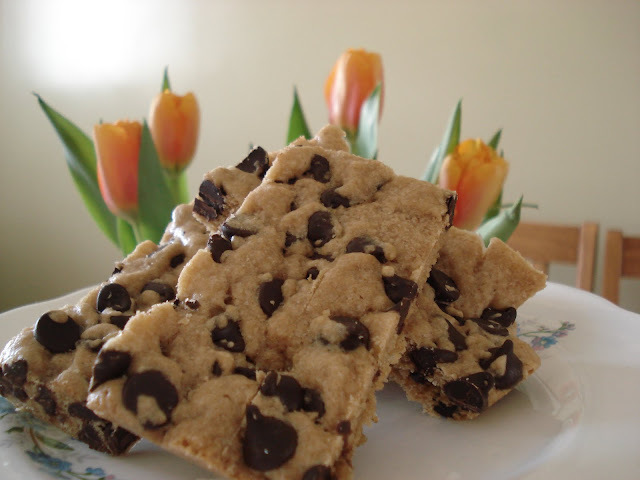 quicker than toll house bar cookies, probably because of using oil and the easy mixing. I used half white chips and half semi sweet. also cut the sugar to 3/4 cup of dark brown. really good. Made these the other night for unexpected company. They were quick and well received by all. i made it on a smaller pan. Timing myself went out the window when I realized I had to refill my flour and sugar canister from downstairs. Thanks for the quick and easy recipe. My kids are sitting playing Monopoly & I just put a plate of the squares in front of them. The first comment after each of them had taken a bite? "MOM YOU SHOULD MAKE THESE MORE OFTEN!!!" I cut the amount of brown sugar down to a cup and they were amply sweet. I also used dark chocolate chips. Thanks so much for sharing. I will make these again as they are so easy to throw together! Wonderful recipe! So easy and quick - a big hit. My husband even prefers these to actual cookies, and they're so much easier! I have these in the oven now. Very quick to mix together. I used apple sauce in place of the oil & cut the sugar down to 3/4 cup (slightly more, b/c it wasn't quite packed). I also had to increase the flour by about 3/8 of a cup, b/c it was too runny. The raw dough tasted pretty good! These are amazing. My whole family loved them and they were do easy to make! Will make often! Loved This recipe! The same great taste as a chocolate chip cookie but so much faster! I did 1.5 times the recipe and subbed 1 cup of butter for the oil. It was pretty runny so I ended up adding about 3/4 cup more flour. I baked for 25 minutes and they came out wonderfully!!! Thanks! Just took mine out of the oven. They're delicious but taste and have the consistancy of a muffin/cake rather then a cookie. ?? not sure why - but still taste great! I did make some changes to the recipe (husband says I can never leave well enough alone!) I substituted applesauce for the oil, which made it more runny so I added more flour and also some unsweetened coconut. Next time will try and add some mini marshmallows on top for the last few minutes of baking as my boys LOVE marshmallows! That sounds like a good idea, I have used coconut extract as well. I cut the sugar to one cup and used margarine and they were still absolutely delicious! So much easier than cookies and my mother, who usually doesn't even like chocolate chip cookies, liked them too. I put it in a 9X13 inch glass dish and baked it in the convection oven for about thirty minutes. I made these last night for me and my husband. Are they ever good!! I wonder if it would work to use less oil....? Maybe 1/2 cup? I have never tried it with less oil. I am thinking it would change the texture of the slice. If you try it with less oil, please comment again and let us know how it worked out. I am very glad you and your husband enjoyed them.